it seems like everyone is jumping on the twittering taco truck/food cart craze here in los angeles, and the border grill is the most recent restaurant to join the trend. one glance at the truck’s menu filled with things like pork, beef, fish & cheese, and there doesn’t appear to be much for us vegans to eat. however, luckily for me brittany from the vegan blog sick of lettuce got wind of some vegan offerings at the border grill truck, and invited me along to check them out. we went to the melrose trading post, where the truck camps out every other sunday and brittany kindly paid our $2 per person admission into the flea market. as you can see, we were VERY curious about the border grill’s vegan options, enough to pay a premium just to get close to the truck. (thanks, britt). it turned out that the only real vegan item on the menu (other than rice, beans and guacamole), was a vegetarian item that had to be modified: the avocado taco. the girl working at the truck was pretty knowledgeable and accommodating and said she could prepare the taco vegan by cooking the avocado separately and omitting the dairy from the corn relish. awesome. 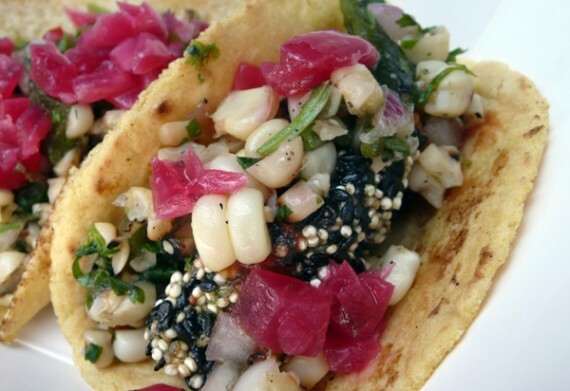 what we ended up with were tacos filled with avocado, quinoa, black sesame seeds, chipotle salsa, corn relish and pickled onion. avocado tacos (VEGANIZED! ): chipotle salsa, corn relish, pickled onion, quinoa and avocado. i’m really glad i went and checked this place out, because the tacos were uniquely delicious. i don’t think i’ve ever had a quinoa stuffed taco before, and certainly not topped off with pickled onion. you can tell a lot of thought went into making this taco different, and combining unusual flavors. it all worked really well together. i also got a side of rice, black beans and guacamole (yeah, we checked all of it was vegan) to round out the experience, and everything tasted great. so if you happen to be around town and see the border grill truck, stop by and get a vegan avocado taco. just be sure to specify you want the taco to be made vegan, because under normal circumstances, it’s just vegetarian. and another heads up, avoid the cumin fries at this place, they are cooked in the same fryer as the fish. ew. 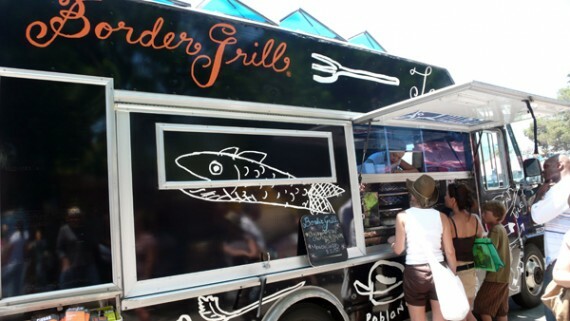 follow the border grill truck on twitter for more info. 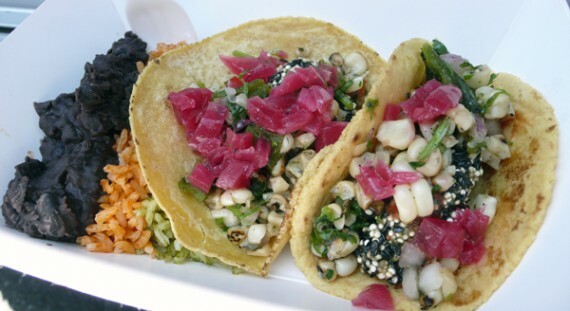 and you can check out brittany’s review of the tacos here.